This page last revised May 20, 2015. 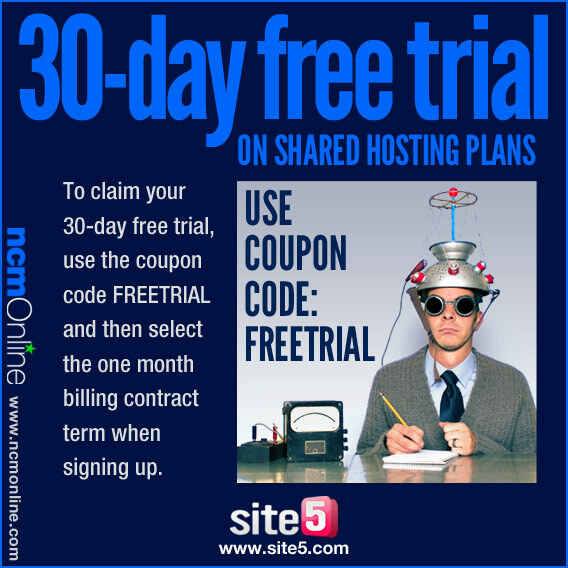 Shop now and receive a 30-day free trial of any new Site5 shared hosting plan. Use promo code FREETRIAL and select the one month billing contract term when you order. This offer is only valid for the following plan types: Web Hosting, Cloud Hosting, Reseller Hosting, and Reseller Cloud Hosting. After 30 days, accounts automatically renew for the billing term (monthly, annually, etc.) selected at sign up. Contact Site5 to cancel after free trial expires or change billing frequency. Please note that payment information is required in advance as hosting services auto renew. No payment is required if a one month contract is selected. One free trial per person only. Free trials are valid only for new shared hosting plan orders and do not apply to renewals of any Site5 product or service not specifically indicated above. This offer may be withdrawn by Site5 at any time without prior notice. Some information on this page: ©Copyright 1999-2015 Site5.com. All rights reserved.